yesterday was my birthday. 🙂 I bought a camera, a canon 40d. I have been wanting to get my own camera for a while now.. I really wanted to get the canon 5d mark II, but I don’t have $2-3k just laying around. I was about to pickup the camera for $650. still a large chunk of money, but much lower. Now that I have a camera, you should expect to see more pictures on the blog. The camera takes CF cards. I have an 8GB a 2GB a 512mb, and the camera comes with a 1gb card. I am not sure yet, but I probably won’t be using the 8gb card with the camera because I use it in my Zaurus. fresh install; what to install. I was planning on making this list looks a little nicer, but I have been busy, so I thought I would just put it up. Download Helper — This program is used for downloading media from websites, such as youtube, or any other video site. GeckoTIP — this is for tablet PCs This allows the tablet input panel to work with firefox. Logmein — This allows me to control the other computers I have remotely. far better than vnc. mediaplayerconnectivity — This allows me to play embedded media. Also it serves as a way to block flash from starting until I allow it. newtabURL — this is awesome. when you open a newtab, it loads my homepage. Also if I have a url in my clipboard and open a new tab it loads that. oldbar — I really like this, I think the new url bar is really annoying, it is just too big. tor-proxy.NET toolbar — proxy. I will not say anymore..
Java Runtime — needed for a lot of stuff. Flashplayer — see that last item. Taskbar shuffle — very useful. Truecrypt — encryption program that works very well. Axcrypt — encryption program that works very well, fast, but isn’t as ‘strong’ as truecrypt. K-lite Full codec pack — allows you to play anything, and not just play it, but it is fast. Notepad++ — best editor I have come accross. Winamp — The best Music player. HotSpot Sheild — a secure proxy. Audacity beta — an audio editor/recorder. the beta seems easier to use. Hamchi — VPN.. extremely useful. Alcohol / virtual clone drive — virtual cds. Unlocker– this allows you to take care of pesky programs that don’t want to be deleted. Office 07 — while Open office is out and free, this opens faster, and it looks better. although Abi-Word is really nice. Filezilla — I used to use WsFTP, but it was a hassle to install. SumatraPDF — so, did I ever tell you that I don’t like adobe? well… I don’t, so if there is a non-adobe verion I go for it. iPhoto Plus 4 — second best image editing program. very easy to use. vistart — newer start menu for xp. Opera — I always like to have a second browser incase I need to kill firefox. but IE will not do, and I don’t like chrome. Recently I ordered a 320gb 7200rpm hdd for my x60t. The x60t had an 80gb 5400rpm drive. That drive was a bit too small for me. 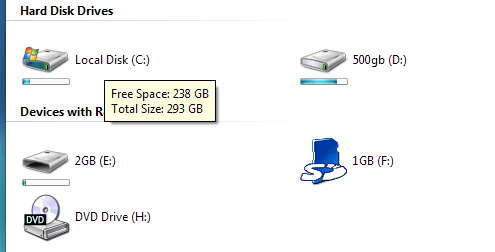 Yes I was able to use it, but it was a hassle dealing with larger files and such.. so I caved and got a new hard drive. As I mentioned before I was using windows 7. I have been using it until I got this hard drive. the main reason I was using it was because it was on a larger hard drive..
now that I have the room I am back to using xp. at first there were a couple features I missed, but I was able to get those added to xp. Also xp seemed to not be faster, but it has much better batterylife. You are currently browsing the Ntw1103's Weblog blog archives for February, 2009.